The latest New England Journal of Medicine has a fascinating article the first author of which was a medical student who was working with Ed Bell in Iowa (I say was a medical student as I believe he has now graduated, with an MD and an epidemiology PhD, and is going on to great things in Wisconsin). It recounts the differences in rates of active treatment of babies by their assigned gestational age at birth, and the subsequent survival and 18 to 20 month outcomes, between the hospitals in the NICHD neonatal research network between 2006 and 2011. Rysavy MA, et al. 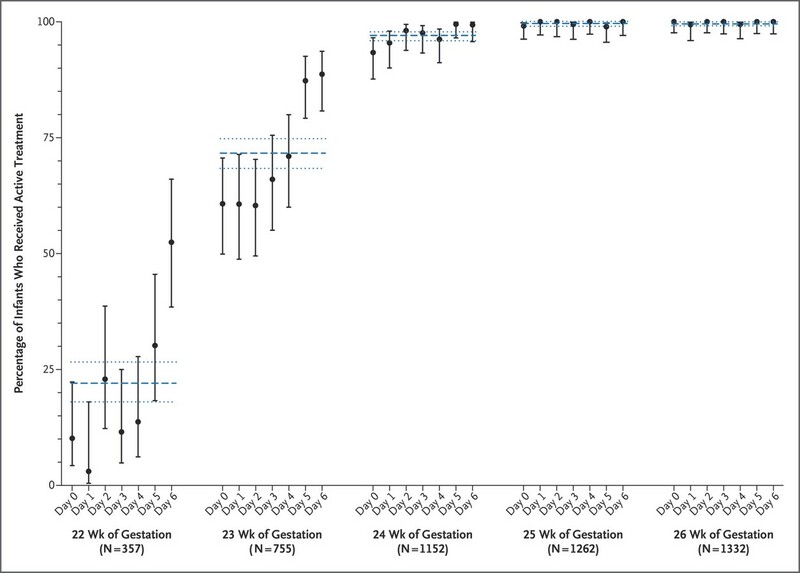 Between-Hospital Variation in Treatment and Outcomes in Extremely Preterm Infants. The New England journal of medicine. 2015;372(19):1801-11. Among the hospitals in the Neonatal Research Network, rates of active treatment at 22 and at 23 weeks GA were very variable. At 22 weeks between 0% and 100% of babies born alive received active intervention, at 23 weeks it was between 25% and 100%. By 24 weeks there was very little difference, 65% in one hospital, but the rest being over 90%. Not surprisingly babies that were so immature did not survive without intensive care, also not surprising therefore, the major factor determining survival was whether or not you were actively treated. The first interesting tidbit from the results, the frequency of active treatment prior to 24 weeks seems to jump up the last 2 days before the actual week is completed. Many more babies are actively treated at 23 weeks 5 days than at 23 weeks 4 days, and at 22+5, especially 22+6, than at 22 +4. At 22 weeks some of the numbers are quite small, with 79 in total getting active intervention, compared to 278 who did not. Survival was 23% for the group overall among those who were actively treated. Six of the 18 survivors had ‘severe NDI’ (‘NeuroDevelopmental Impairment’), 4 of them being a Bayley cognition score under 70, 2 having disabling cerebral palsy. (These numbers are in the supplementary appendix). This might be repetitive ( I know it is) but a low score on a Bayley evaluation is not an impairment, it is evidence of developmental delay, which may or may not (and often does) catch up in the future. This is still true with the Bayley version 3, as I discussed recently. An impairment is a “loss or abnormality of function”, and I wish the NRN stopped using this term. Disabling CP, death, delay in cognitive or language development, deafness and blindness are all lumped together in the outcome ‘death or NDI’. I don’t think that composite is very useful for parents, nor should it be used for our counseling and decision making with them. The actual numbers for the individual hospitals are in this figure: It is of interest that the survival at hospitals that treated all their 22 week infants actively are below the 23% I mentioned above, presumably because hospitals that are treating a proportion, but not all, of such infants tend to actively treat infants who are more likely to survive than the average (such as with a higher birth weight, or who have had time to complete steroids). The legend (slightly edited) to the figure is below. Relationship between hospital rates of active treatment of extremely preterm infants born at 22, 23, or 24 weeks of gestation and hospital rates of outcomes among such patients. Outcome rates are risk-adjusted to account for differences in infant demographic and clinical characteristics among hospitals. Black dots represent hospital rates of the specified outcome. 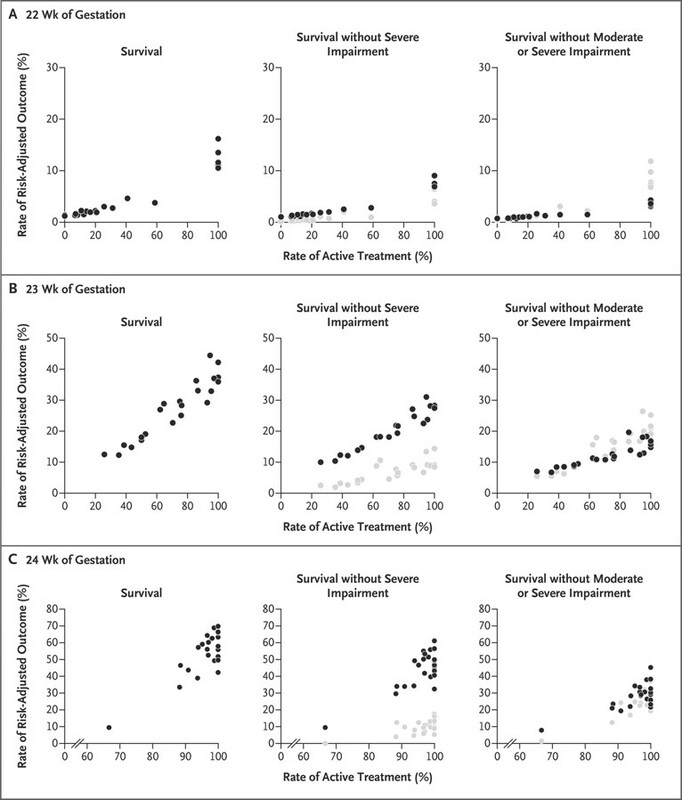 Gray dots represent the difference between the adjusted hospital rates of survival and survival without impairment and represent an estimate of the adjusted rate of survival with impairment. It took me a few minutes to figure out the gray dots on the graphs, they are an estimate of the babies who survive with severe impairment or with moderate or severe impairment. (I read it too fast the first time). Most of the ‘moderate impairment’ is a Bayley score between 70 and 84, which has very little significance for long term functioning of these kids. Jon Tyson has been saying for years, as have we, (and he gave a presentation about this at the PAS meeting that just finished) that our best guess at the fetal gestational age is only one factor that we should be included in our decision-making, and that to have strict rules (even if arrived at by some sort of consensus) based on gestational age alone is irrational. Part of that irrationality is based on the fact that we never know the GA unless the ovum was fertilized in an assisted reproduction center. The creep up as GA approaches 23 and 24 weeks, is evidence of this irrationality; surely if based on likelihood of survival or ‘survival without NDI’, the frequency of active intervention should increase gradually over the week, and not change as we click past midnight between Thursday and Friday. Dr Tyson was proposing that we should try and develop thresholds based on predicted outcomes and suggested that we should develop a consensus with parents about which thresholds are appropriate. I am not entirely in agreement with this approach, especially as his example was to use the composite outcome of ‘survival without severe NDI’. I think we should be developing methods, along with parents, to ensure that the best decision is made for each family. It won’t necessarily be at the same predicted percentage survival, or ‘survival without severe NDI’ where active intervention becomes the right answer for each family. I think we should separate the calculation of survival from the discussion of long term outcomes, and that we could investigate, with each family, which outcomes are most important to them, and then try and figure out the likelihood of having, or avoiding those outcomes. I don’t think that being super precise about the figures is that valuable either: if the risk of death is 21 compared to 31% should that, or would that, make a difference to many families’ decisions? I think the value of the NICHD calculator is to point out the relative importance of non-GA factors, not to give a precise prediction (which is, in any case, already out of date) and then take that figure to the parents bedside, even though that is what is commonly being done (as Bill Meadow’s group showed in an abstract at this years PAS meeting)..
One major missing factor in all this is what I just wrote about a couple of posts ago, the babies who die in utero, because there is no active Obstetric intervention. I know Matt Rysavy is trying to get at this point, but it might be difficult to get good data, unless the NRN starts collecting it prospectively. I wouldn’t be surprised if obtaining this data would make some of the center differences even more striking, as centers with a tendency to actively intervene after birth might also intervene more actively before birth. But maybe not, it would be good to know. Certainly as Neil Marlow notes in his accompanying editorial, the Epicure 2 study showed that “referral to a suitable perinatal center for delivery is a major determinant of survival”. As John Lantos and Bill Meadow have pointed out, if there was a similar difference between centers in the USA in terms of treatment of other serious diseases (such as metastatic breast cancer as one example), and one center treated all of the patients referred, but another decided that it wasn’t worth it and let them all die, there would be outrage! Especially if some center had long term survival rates of 23%, and others had zero. This entry was posted in Neonatal Research and tagged Ethics, families, long term outcomes, mortality. Bookmark the permalink.